Synchronicity is a coincidence of events that seem to be meaningfully related. For those who believe in the powers of magic, synchronicity can be seen as more than just random chance. One might even go as far as to say that when synchronicity happens it is a sign that invisible forces are showing a guiding hand. It would be foolish to ignore them. And that is how I felt when, on the same day, I unexpectedly received a gift of the book London's Camelot and the Secrets of the Grail from its author, Chris Street, and then received an invite to visit a distant cousin and his wife, who I had not seen for ages, in early December. How are these connected? Read on. London's Camelot and the Secrets of the Grail looks at London's claim to be the site of King Arthur's famous castle. There are, of course, places far more commonly associated with Camelot, especially Cornwall and Wales. Chris Street, through examining maps, historical records and what has been written on the legends of King Arthur, shows that London has as good a claim as either of those places to be Camelot's real home. Historical maps clearly show a place in North London bearing the name Camelot - and this name might well date back to Celtic times. Local legends say there was once a Camelot Castle on the spot, and amateur archaeological digs uncovered large stones, a drawbridge and dungeons that seem to belong to a large castle. (To make matters more intriguing there are also tales of buried treasure, but that's tangential to the main story). There is an ancient well on the site - now little more than a muddy pool - at which many people claim to have seen a vision of a lady in white. Some say she is a grail maiden bearing the holy chalice of healing water, others say she is a vision of the Goddess Brigit, long associated with sacred springs. For grail questers, this is a place worth visiting. Intriguing you may say, but where is the synchronicity? Well, the site of London's Camelot is modern day Trent Park, in Barnet, North East London. Looking on a map to find out how to get to the home of my distant relatives who had invited me to visit, I discovered that they also lived in that part of North East London, just a few minutes walk from Trent Park. And, to add the coincidence of events, the name of my cousin's wife is Brigit. I certainly won't be ignoring the messages of synchronicity. When I visit my relatives in a few weeks time, I will do as Chris Street suggested when he wrote inside the cover of the book he sent me: "Seek the grail maidens at the end of the Piccadilly Line!" I'll let you know what I find at Camelot. 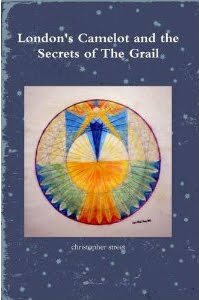 The grail always become interesting secret. I like your post.